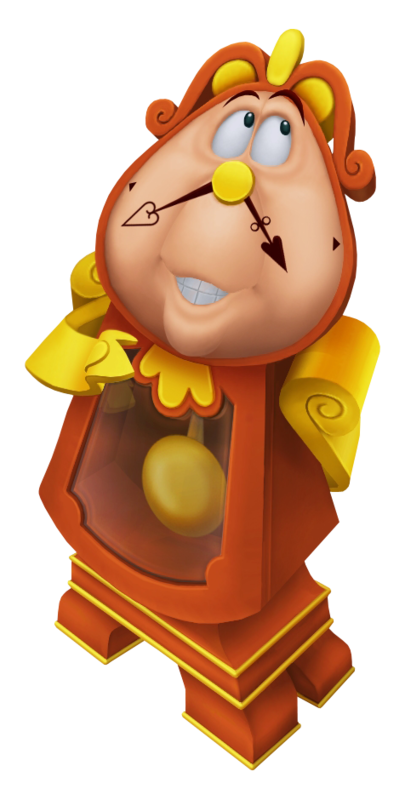 As the Beast's majordomo, Cogsworth is a stickler for the rules and counts tardiness as the eighth deadly sin, hence his enchanted form as a talking grandfather clock. Cogsworth's bossiness is in full effect whenever the other castle servants are rebelling against their master, but more often not is overruled by the majority, all of whom would go as far as breaking the rules in order to make the Beast happy. Cogsworth is instrumental in revealing the castle's enchanted origin to Sora's party and helps them knock some sense into the Beast when the latter succumbs to Xaldin's influence. Cogsworth was once a human along with all the Beast's servants in the castle. His greatest wish, shared with others, is to become human again and this can only happen if his master finds a love who loves him back. Nose ticking, eyes watching, Cogsworth is the walking and talking clock that stands watch in the Beast's Castle.